Supports plants in an upright position. Wrought iron hanging plant hook. Matte black powder coated finish. Holds up to 16" pot. Weight capacity: 33 lbs. For hanging plants. 2.5" overall height and 1.42" depth. Includes 3 black, vinyl coated hooks. For hanging planters. Includes toggle bolts. 8 pound maximum load capacity. 6" black hanging plant bracket. Holds up to 6" pots. Easy installation. 4" planter brackets. Holds up to 6" pots. Easy installation. 4" planter brackets. For hanging plants. 2.5" overall height and 1.42" depth. 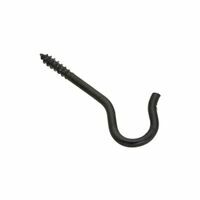 Includes 3 black, vinyl coated hooks. For hanging planters. Includes toggle bolts. 8 pound maximum load capacity. For hanging planters. Includes toggle bolts. 8 pound maximum load capacity. 38 cm (15'') diameter wire hoop with 3 supports. Keeps peonies upright. For hanging plants or extender chains. Includes toggle bolt. Supports plants in an upright position. Wrought iron hanging plant hook. Matte black powder coated finish. Holds up to 16" pot. Weight capacity: 33 lbs. Holds up to a 12" pot. Easy installation. 9" planter bracket. For hanging plants or extender chains. Includes toggle bolt. For hanging plants, wind chimes, bird feeder/houses and lanterns. For hanging plants, wind chimes, bird feeder/houses and lanterns. Holds up to 10" pots. Easy installation. 8" planter brackets. Holds up to a 14" pot. Swivels 180 degrees for even sun. 10" planter bracket. Easy installation. For hanging plants and lamps. Mounting Screws included. For hanging plants and lamps. Mounting Screws included. For hanging plants and lamps. Mounting Screws included. For hanging plants and lamps. Mounting Screws included.